Ages 9 through 17. This book can be used to help students with language and learning disabilities improve listening skills, sentence processing, verbal reasoning, and knowledge of basic vocabulary. The reproducible worksheet activities require students to pay close attention to the meaning of language and to use words in a variety of ways. Skills emphasized include defining words, categorizing, giving specific information, identifying incorrect use of words, comparing meanings of statements, using contextual information to identify word meanings, correcting grammatical errors, using words with multiple meanings, using prefixes to create words, and MORE! Grammar and Sentence Building. The activities in this section require students to focus their attention on sentence structure and the use of specific parts of speech. Using Contractions. Each worksheet includes sentences with grammatical forms that can be combined to create contractions. Activities focus on contractions with not, have, forms of be, will, and would. Words and Categories. 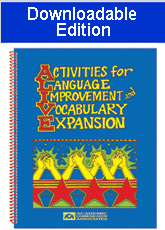 The activities in this section help students develop vocabulary, categorization skills, and more effective word usage. Activities included are Categorizing Words, Giving Specific Details, Words and Their Opposites, Using Prefixes, Word Replacement, Sentence Revision, Defining Words in Sentence Contexts, and Words that Make Sense. Words that Sound the Same. The activities in this section focus specifically on words that sound the same but have different meanings. Activities included are Defining Words with Multiple Meanings, Find the Homophones, Pick the Right Word, and Identifying the Incorrect Use of Words. Understanding and Using Common Phrases. The activities in this section focus on specific idiomatic expressions. Activities included are Defining Expressions in Stories, Short Expressions and Their Meanings, and Finish It Up (completing sentences). This is an excellent resource for targeting academic language standards, as well as language skills that are critical for effective communication. Reproducible worksheets are included.